An experience of 'We Don't Need Another Hero', 10th Berlin Biennale for Contemporary Art. Rossanne Pellegrino was one of 10 a-n Artist members who attended the Berlin Biennale preview. 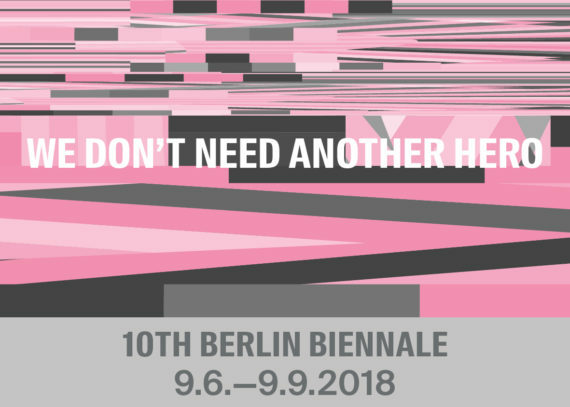 Titled ‘We Don’t Need Another Hero’, the 10th Berlin Biennale for Contemporary Art explores the rethinking of social and political constructs as we have always known them, inviting artists and audiences to re-examine, to un-do and to reconfigure these models of thinking. Here, the focus lies on the possibilities of what could be as opposed to relying on history to dictate our futures. As Biennale curator Gabi Ngcobo states, “addressing history in the present is to speak to a future unknown”. A statement both exciting and daunting all at once. It was difficult to imagine what I could expect from the Berlin Biennale with such a title, beyond a dystopian-type depiction of a future of Mad Max-esque proportions. The Berlin Biennale takes place in five venues across the city and my experience of the Biennale began at the Akademie der Künste on Hanseatenweg. I entered the exhibition to a room of powerful works exploring conflict in very different ways. 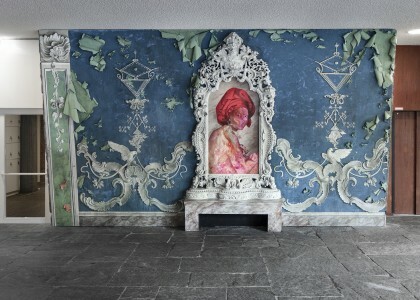 For example, artist Firelei Báez incorporates painting, sculpture and architecture in her installation which explores the histories surrounding the various iterations of the name “Sans-Souci” – from the leisure estate of Frederick the Great (Sanssouci) to the Haitian Colonel, Jean-Baptiste Sans-Souci. The work, Index (given the ground one has to actively look away), 2018 is an arresting collection of mixed media images using traditional maps and portraiture alongside modern day, surreal scenes: such as the scene of a vacant-seeming space populated with a couch next to an oven and boiler. Atop the couch rests a chair and an oversized palm leaf, emitting what looks like black and white smoke but upon closer inspection could just as likely be a head of windblown hair. I could have stared for hours at this installation. I also have a new found love of pink coloured ink. Little did I know at the time that a piece by the same artist which is just as impressive lie directly beneath me on the floor below, hidden under the main staircase. Finding this oil on canvas, for Marie-Louise Coidavid, exiled, keeper of order, Anacaona, 2018, was like stumbling upon a secret and the impact was immense. But for the sake of continuity of the exhibition, I’ll return to my description of the first room. After being absorbed by Index (given the ground one has to actively look away), 2018, I was surprised to find an Oscar Murillo piece part of Creative Conscience, 2018, hiding in a cavity behind the wall where Index hang. The exhibition was full of surprises and there were further Murillo pieces located in unexpected places throughout the exhibition. Also impactful were the reeds occasionally growing through the wooden flooring of the Akademie der Künst; a beautiful piece by Sara Haq titled, Trans:plant, 2018. Colourful works by Lubaina Himid from her series, On the Night of the Full Moon, 2018 with slogans such as ‘don’t let loneliness kill us’ and ‘champagne has ceased to be drunk out of slippers’ made me want to know more. (I went away and researched the history of the latter – apparently drinking champagne out of one’s shoe was a thing in the Roaring Twenties). Further along the exhibition were more discoveries. Powerful and at the same time delicate were the oil paintings on linen canvases by Lynette Yiadom-Boakye. Her use of rich colour palettes and evocative titles were true to form. These paintings were found neighbouring a re-creation of an archaeological excavation (Impossible is Nothing, 2016 by Thierry Oussou) hidden behind walls with peep holes drilled at various points for inquisitive viewers to peer through. The work flows from inside the walls of the Akademie der Künst, to outdoors. 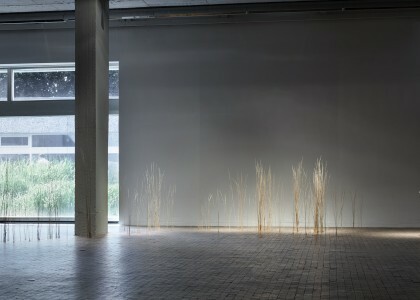 Something which makes Sara Haq’s clusters of reeds growing through the floor all the more impactful – nature and art inside, and also out. Further works part of Oscar Murillo’s Creative Conscience, 2018 were found in a quiet open courtyard of the gallery grounds. Curling around the courtyard’s tree (or perhaps taking shelter under it) is a striking piece made up of intestine-like forms that look almost like human bodies ready to be “devoured by vultures”. The forms are covered in cloth with slogans and trade routes; a commentary on the normalisation of aggression through labour. My next stop in the Berlin Biennale was KW Institute for Contemporary Art where the works featured were immersive and all in all, quite sublime: from pieces such as Joanna Piotrowska’s Frowst (2013-2014) which investigates issues such as the female condition and the nuclear family through personal behaviour and the body with thoughtful, beautiful photography and projection, to Untitled (Of Occult Instability) [Feelings] (2016-2018) by Dineo Seshee Bopape exploring thinking through literature and sound. Upon entering the exhibition Lorena Gutiérrez Camejo’s, Where are the heroes, 2015-16 jumps out to the viewer. Her boldly coloured painting- a collection of military rankings or ribbons- articulate her experience of living in Cuba and her thoughts on the notion of power. Before knowing more about this work, this painting could have been some sort of television test pattern or an accumulation of world flags to make one universal crest. Further along the exhibition were striking works by Mildred Thompson produced in the 1970s – a bright green wood assemblage and silkscreen prints – and also Liz Johnson Arthur’s photography series, People of the Twentieth Century. Here, questions of how people are represented in photographs and who portrays them, are investigated through engaging photographic images on various surfaces – vintage paper, cloth and brightly coloured felt. There were more Lubaina Himid pieces; I wanted to collect them up from all the Biennale venues and see them on the one wall to spend more time considering their slogans and investigating her use of bold colours. For me however, the stand out piece was the delicately beautiful and mesmerising work by Tony Cruz Pabón titled, Distance Drawing, San Juan/Berlin. An attempt to draw the distance from San Kuan to Berlin (approximate 7,681km). Realized only 0.138 percent (10.60km), 2018. When I first spotted this piece I stopped in my tracks; was it a shadow; was it thin fabric; could I touch it to find out? (No, no and also, no.) It was in fact a series of graphite lines drawn onto the wall and floor at various angles and minute distances apart. At first glance it was hard to decipher what was drawn and what could be shadows cast. I read the wall text: “Tony Cruz considers his travels as impossible drawings, which he carries out with pencil in an effort to trace the distances separating two places, usually San Juan, where he lives, and the city where the work is exhibited, in this case Berlin. 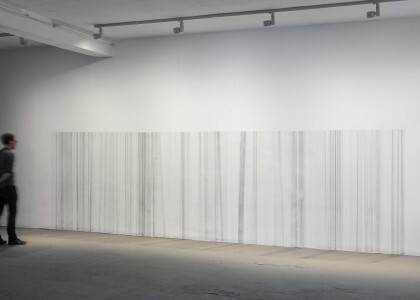 The daily endeavours of the artist, who worked on the drawing over the course of a month, remain on the wall and on the ground – unfinished, not only as a record of his journey to Berlin but also as traces of a failed journey to plot something ungraspable.” Even the description of the work is breathtaking. As my experience of the Berlin Biennale continued at the various other venues across the city what also stood out to me was the use of spaces displaying the art. The ZK/U – Center for Arts and Urbanistics’ overtaking of an old disused railway station, for example, embodied what has been happening across the city. The use of buildings with former purposes very different from its present-day function can be found throughout Berlin. And possibly this is what it means in an architectural sense to address history in the present and speak to a future unknown. And with this discovery, so ended my Berlin Biennale 2018 experience. Rossanne Pellegrino is a mixed media artist, born in Australia and primarily residing in London. Rossanne’s distinctive documentary-style photography and her ability to employ various techniques such as embroidery on photography, photo transfer and Polaroid manipulation have resulted in a diverse body of work; from black and white photojournalism to expressive imagery that blurs the border between photography and the handcrafted. Embedded within her work is a continued exploration into nostalgia, memory and identity. In her most recent series of imagery 'Strange New World', Rossanne explores false memory recall through embroidery on found photographs. Her title image, 'Strange New World', is currently part of the Royal Academy of Arts Summer Exhibition 2018. To view Rossanne's online portfolio visit www.rossannepellegrino.com.